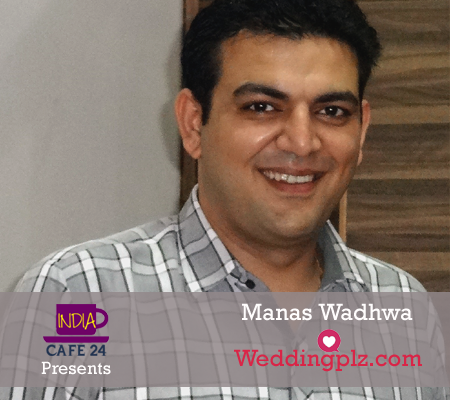 1) Mr. Manas Wadhwa, Welcome to Indiacafe24.com. Its an honor for us to have you with us for this session. Before we start, will insist you Manas to give us a brief about you, your education, and your family? Thank you so much Samata for giving me an opportunity to have the session with you and your website. I am a non technical person completely in love with technology. Inquisitive by nature, I like doing extensive research before finalizing on any new ideas and solutions. Weddingplz came as a solution to my own genuine need of converting countless vendor details and questions to a single click process. Prior to finding weddingplz, I co-founded an award winning chain of restaurants. The chain was also the official Public Caterer to F1 formula Racing 2013. I have also founded Virtual Space Info-tech, which is among the top Virtual Tour Company in India, and has some of the most coveted brand names under its client list viz. Max Hospitals, Amity University, Mercedes Benz, IGI Airport and many more. 2) Why you decided to try your luck as an entrepreneur and not in some glamorous corporate position in some leading organizations of the industries? I have always been an entrepreneur at heart. Ever since I remember my only passion was to start something of my own. To me entrepreneurship is about having the freedom to solve a problem my way. To be able to walk through a business and start thinking of how can it be made better as an entrepreneur I am not a backseat driver – I actually do something if the problem I see has scale and I think I can solve it. Freedom is my driver. I love understanding the consumer needs and thinking of ways to fulfill the gap by creating my own business model. 3) As per you whats the actual difference between an entrepreneur and a corporate employee. Whats the pros and cons of both the profiles? The main difference between an entrepreneur and a corporate employee is the risk taking appetite. An entrepreneur is not averse to taking risks as he knows that it’s the only way he will learn and grow and would be able to find new opportunities. Many a times a lot of employees say they would like to own their own business, but their fears keep them from taking the necessary risks. 4) What exactly is the thought process behind making “WeddingPlz” your dream project? In a nation where wedding talks begin the moment a child is born to a clocking of approx 100 lakh weddings a year, stems the need of a portal that houses everything that’s required to plan and organize a wedding. That’s where weddingplz comes into picture; Our plan is to make Weddingplz synonymous with weddings! 5) Will insist you to give a brief about WeddingPlz and how and when it was born? The idea came when I was attending my cousin’s wedding in Ludhiana. The inconvenience caused to me to find one good wedding vendor at the last moment in the vicinity of my hotel, is what prompted me to start a wedding portal of my own. 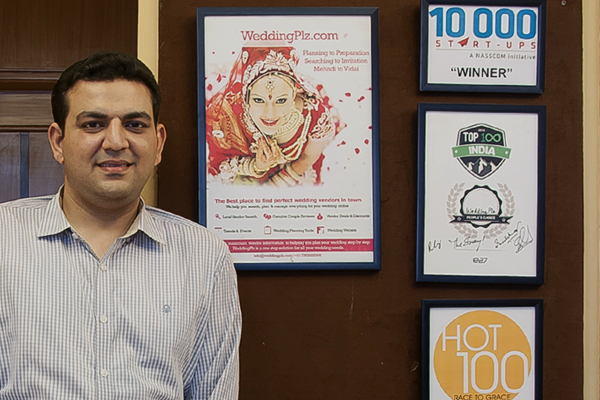 Seeing how easy it was to search for food joints on ‘Zomato’ and how difficult it was to search for wedding products and services on net, is what deepened my conviction to start exploring this idea even further, thus giving rise to WeddingPlz.com – with an apt punch line which very well tells its purpose – Search the best wedding vendors in town! 6) Indian Weddings are just like Big Fat celebrations, so as per your view how far WeddingPlz managed to help in making the celebrations more happening in India? What makes Weddingplz.com unique is that it’s the only wedding portal that smoothly integrates everything that’s required to plan and organize a wedding into a single website thus helping the to-be-wed couples – search manage and organize everything for their wedding online. 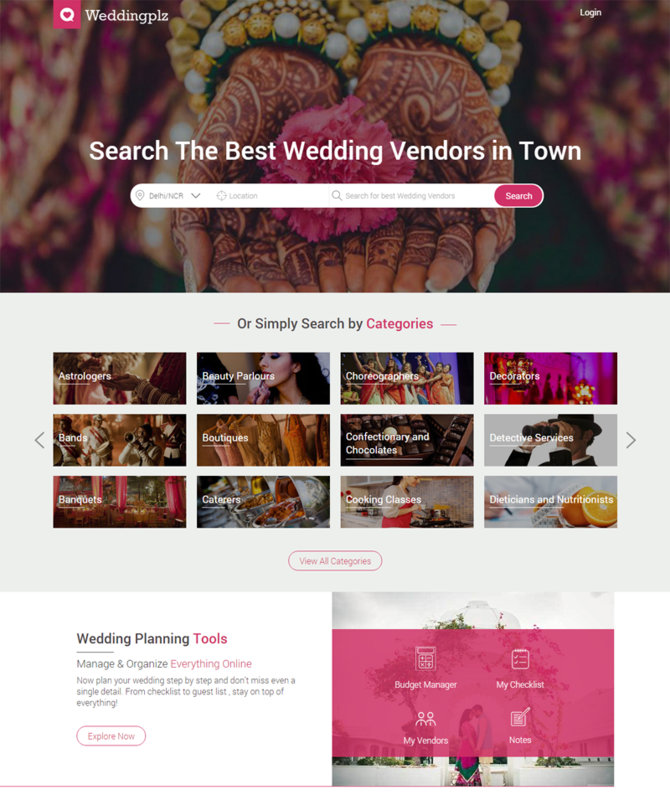 With an array of features viz local vendor search, genuine couple reviews, upcoming wedding events & exhibitions, Vendor deals & discounts, real weddings, to amazing wedding planning tools like budget manager, checklist, to-do list management, e-Invites; it is the most exhaustive yet comprehensive wedding search portal currently present in India, making the Big Fat Indian Weddings plan their wedding hassle free. 7) Which section of the society is the targeted audience for WeddingPlz? Are there vendors available in your database who can offer services to lower middle class and middle class family weddings? We have two sets of customers: First – anybody who is about to get married, i.e. the prospective bride& groom and everybody involved in their wedding planning & preparation viz. – their family and friends; and Second, The vendors whose business is listed on WeddingPlz. WeddingPlz does a free vendor listing and hence the details and information and services available to the users are absolutely free of cost. The fact that WeddingPlz provides the maximum business details and information makes us a choice portal. Our database has more than 37,500 wedding vendors listed with us and caters to all segments of society, from premium to economical sections as well. 8) Audience from which cities of India can avail the benefit offered by WeddingPlz? across any other wedding portal present in India. We would be launching in Bangalore by the end of this year and plan to go PAN India by end of 2016. 9) What are your future expansion plans or rather say in which other cities of India you are planning to expand your services? Expansion of WeddingPlz, both in terms of Geographic expansion and Product expansion is foremost on our agenda and we are aggressively pursuing it. Starting with Delhi last year, we have launched in 3 more cities till now, Mumbai, Chandigarh and Ludhiana and plan to launch in Bangalore by the end of this year. Launch in 2 more cities by mid 2016 and a pan India presence is what we aim for by end of 2016. In terms of product expansion we plan to launch Weddingplz mobile App by the end of this year and would be coming up with our very own wedding directory of wedding vendors, something that is unprecedented till now. Resolutely pursuing the above mentioned plans, the team expansion definitely will go parallel. 10) Taking the risk of launching a startup business was not easy for you, so how you managed to arrange the fund and who helped you? Currently weddingplz is bootstrapped but we are definitely looking to raise funds from investors. We have started with our initial round of seeking fund raising and are in talks with a couple of investors as of now. 11) What is the TeamSize of WeddingPlz ( WP) at current time? We are a bunch 25 highly passionate and enthusiastic people. 12) How vendors can get in touch with WP to get enrolled in your vendor data base and what are the criteria for that? Listing in weddingplz.com is completely free of cost and any wedding vendor can get listed with us by either filling the Add your Business form on our website or by leaving a mail or message for us. Besides this we have a data department that collects, curates and farms data. We have both in-house as well as on-field data team that work in coordination with each other and procure vendor database from all over the country. All our data is verified & cross verified with recorded phone lines to maintain accuracy and quality. 13) What the new addition you made in the UI of WP and how effective and helpful it will be for the people ready to plan their wedding in a fairy tale manner? Our new UI is very user friendly and we have two new features added to our website – Wedding Photo Gallery which is a collection of thousands of wedding pictures of different themes, categories and works as a vendor inspiration board. And the other one being Real Weddings which is a collection of hundreds of real wedding images , where the to-be-wed can browse through beautiful, candid, traditional any type of wedding images to get ideas for their wedding. 14) What are your other passions in life and how you manage to make time for it? I like reading books. Though I find very less time for it but I still ensure that I manage to take at least some time say 15min to half an hour before going to sleep. 15) Where you see WP 5 years down the line? The leading wedding portal of India. .
16) Any Guru Mantra for budding entrepreneurs? Discover your passion and go for it as it’s the most important ingredient for success. 17) In one line define” WeddingPlz”? Weddingplz.com is a wedding vendor discovery platform that houses everything that a to-be-wed couple needs to plan, manage and organize a wedding. A non technical person completely in love with technology, I am passionate about building great teams and scalable businesses.